While mountain biking is both fun and exhilarating, it can also be quite dangerous. It’s easy to think that you’ll never get into an accident, but bike accident statistics suggest that it’s far more likely than you think. Although the number of bike accidents seem to be declining over the years, a larger number of these accidents tend to be fatal. In fact, the number of fatalities due to bike crash has increased by more than 12% since 2015. Mountain bike injuries is also quite common. Want a happy and pain-free riding experience? Here are 7 ways to prevent mountain bike injuries. Getting a professional bike fit is one of the most commonly skipped step when buying a bike. Why? It’s because most people assume that bike fitting will only benefit professional cyclists. That’s not true. Even leisure riders should consider a bike fit. 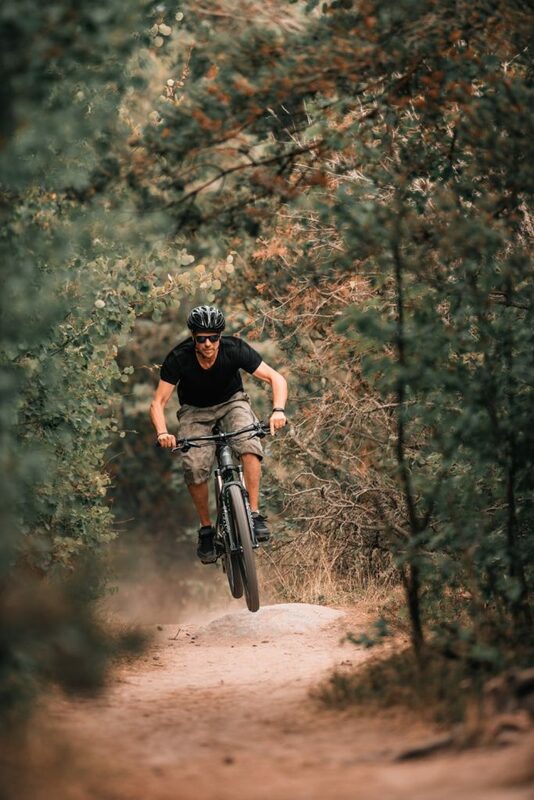 Not only will it help you ride stronger and more comfortably, it can also help prevent mountain bike injuries and discomfort. If you are suffering from shoulder discomfort, lower back pain, knee pain, numb hands or toes, it is likely due to improper bike fit. Lower back pain results from bike seat that is too far away from the handlebars. Neck soreness is usually caused by aero bars or handlebars that are too low. Make sure that you get a bike that has been specifically fit for you. We understand you’re excited to hop on the bike and meet with your buddies. But for your own safety, it is important to do some maintenance checks before you go. It will not only prevent major problems from occurring, it can also save your life. Plus, it will help keep your bike in good working order. Check the brakes, tires, chains, gears, seatpost, and handle bar stem. You want to make sure that your bike is ready to go. Performing all these checks will ensure your safety each time you go out. The foods you eat before a long bike ride can improve or inhibit how you perform. The idea is to keep your brain focused, your muscles energized, and the rest of your systems firing on all cylinders no matter what. Carbohydrates have gotten a bad rap, but they are actually important for the energy required to be physically active. Since our body can only store a relatively small amount of carbohydrates, it should be consumed in small amounts and frequently. For a weekend ride under 3 hours, porridge would be a great pre-ride meal. But for longer rides, an additional 2 to 3 egg omelette is recommended. Eat at least 90 minutes to 2 hours before your ride to allow for digestion. Don’t forget to drink lots of water, especially in the few hours before you head out. Remember, proper hydration will ensure your muscles are working properly. Just like any other physical activities, you need to warm up before riding a bike. This is especially important if you are planning to go for a long distance ride. Skipping your warm up may save you time, but your performance may suffer. Having a warm up routine can help you feel more relaxed and in control. It relaxes your muscles, increases range of motion to your joints, and makes your pedal stroke more fluid. Not only will it protect you from mountain bike injuries, it will also help you perform better. You want to make sure you’re warm before you head out on your bike. However, be careful that you don’t overstretch. 15 to 20 minutes of stretching and warm-up exercise is enough to make sure you are fully prepared. While mountain biking is all about fun and freedom in the great outdoors, your safety should be your top priority. The number one rule in mountain bike safety is to always wear a helmet. The strap may be itchy or it may be too hot outside, but you should never ride the bike without a helmet on. Don’t forget to give it a once over to make sure there are no cracks on the outer shell or inner surface. For those who are looking to ride rough terrain, you’ll need added protection to prevent mountain bike injuries. Body armor, knee pads, ankle guards, elbow pads, gloves, and protective glasses are just what you need when out on the trails. You’ll never know when you’ll get into an accident, so make sure that you wear protective gear every time you ride your bike. Cyclists are good at many things, but moderation isn’t one of them. They would make an all-out effort on their bikes and push themselves to the limit. Some aches and discomfort are a part of cycling. As with any other types of exercises, it’s normal to feel sore after a hard ride. But there’s a difference between experiencing a bit of ache the next day and your body hitting bottom. Listen to your body. Do not hesitate to tell your fellow riders how you feel. If you’re feeling lightheaded, weak or if you would simply like to stop, let them know. You might be tempted to ignore the symptoms and carry on, but please resist the urge to do so. The consequences can be quite severe. We’re not saying that you shouldn’t push yourself. Just listen to your body. If you’re tired, then take a rest. Don’t be too proud. Most cyclist aim to ride stronger, farther, and longer. They think they can’t afford to go easy. But if you train too hard, you actually put too much stress on your body. Without adequate rest, burnout, injury, and fatigue can set in. Your downtime is just as important as the time you spend on the saddle. We highly recommend that you also schedule rest into your training plan. This allows your body to recover and repair muscle damage. Ride hard, recover harder. The more high intensity cycling you’re doing, the more rest you’ll likely need. Don’t skimp on rest days.